Does The Megalodon Shark Still Exist? - We Love Sharks! Does The Megalodon Shark Still Exist? - We Love Sharks! The Megalodon shark was the stuff of nightmares. After all, this was a shark that could rip large sea animals apart effortlessly with teeth that earned it the name “Big tooth”. It’s often said that we know as little about the depths of Earth’s oceans as we do about outer space. Consider how frightening and intriguing some of the yet to be discovered species that roam these deep, dark places could be. The few glimpses of knowledge we have seen appear nothing less than terrifying: vicious predators, extreme sizes, and new ways to kill prey. With all these predators roaming around unknown waters, a question has arisen around the scientific world: could the Megalodon shark still be alive? What Was The Megalodon Shark? The Megalodon shark (meaning “Big tooth”) lived in the Cenozoic Era, between 23 and 2.6 million years ago. It is reputed to be one of the most vicious predators in history. Megalodon easily dwarfed the great white shark in size by about two or three times. Surely, after examining the physical characteristics of the species, we can understand why it earned such a terrible reputation. The shark is believed to have measured between 13 and 17 meters (43 – 56 feet) in length, quite uncommon even for whale sharks. The biggest fossils of the species even measured closer to 25 meters (82 feet). The teeth of this animal were also quite impressive. The fossilized teeth are so large that for long, people actually thought they were dragon tongues. These teeth averagely measured between 11 and 17 cm (4 – 6.7 in. ), depending on the shark’s total body size. Scientists have also reached a consensus regarding the predator’s body mass. Based on its length, the Megalodon shark could easily weigh between 59 and 103 metric tons (59, 000 – 103, 000 kg). Clearly, the Megalodon was much, much larger than the great white shark, making it a formidable predator. Its primary diet would have been whales and other sea creatures of immense size like sea cows, dolphins, giant sea lions, etc. Research on many fossilized whale bones showed bite marks consistent in size with the Megalodon’s almost 7-inch teeth. And continuous research findings continue to shed more light on Megalodon’s whale hunting pattern. For instance, in the late 1900s, Dr. Bretton Kent, a paleontologist, examined the remains of a 30-foot-long prehistoric baleen whale. The whale had been attacked by a Megalodon. His findings showed that the “monster shark” was far more aggressive in its attack style than the great white. The great white attacks by hitting its victims from below and retreating for a while the prey bleeds out. But not Megadolon: its jaws were massive and filled with large and robust teeth. This lethal combination could pack a biting force of between 24,400 to 41,000-pounds – the strongest ever recorded. By clamping down on the tough bony portions of its prey, like the shoulders, upper spine, rib cage and front flippers, this fearful shark would crush its victims leading to swift and instant death. In addition, more studies on fossil evidence show other hunting techniques. Such techniques ranged from ripping apart or biting off fins to immobilize their prey, or attacking/grabbing small whales from below. The remains of its teeth have been found all over the world and are still regularly found to date. From Australia and New Zealand to England, Denmark, Japan, India, Croatia, and even a local river in Suffolk, Virginia USA. These findings lead us to believe that the Megalodon shark was a global shark and it apparently favored warmer coastal waters. Could it be that its inability to adapt to the rapidly cooling waters of the Ice Age contributed to its demise? We’ve used the past tense everywhere in this article, but have we used it correctly? Is the Megalodon shark 100% extinct? The short answer to the question is simple: yes, the species is extinct. Although some people have gone out of their way to try to produce evidence that the shark still roams our deep waters, no documentary has every provided a single piece of proof that the Megalodon could still be swimming in our deep oceans. Moreover, the footage used in some documentaries has been proven to be fake again and again. One image, in particular, used in these documentaries and theories, shows the fins of a great shark next to a submarine. This picture was taken from a fictional Discovery Channel documentary. Nobody has ever found new evidence that points to the possibility that this predator still lives. 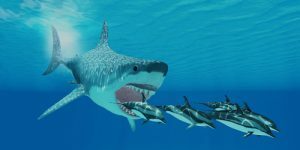 It would be tough for it to survive, too – the large animals it preyed on millions of years ago are also extinct, and it’s hard to believe that a 20-meter-long predator could feast on small fish and survive. In an age in which press and persons alike look for sensational news every single day, we’re obliged to share the real, scientific conclusion with the world. Furthermore, there are numerous scientific papers that dispute the existence of Megadolon. You can find many of these papers online with a single Google search. While it would certainly be interesting to study such a formidable predator, it is simply not possible anymore. Though it would be a spectacular discovery, for now, sadly this creature will only remain in our imagination. The Megalodon shark is extinct and has been so for up to 3 million years now. No scientific evidence can contest this fact.